President Erdogan's star power is on the decline. Early in 2010, James Jeffrey, then U.S. ambassador to Turkey, sent a cable to Washington, DC in which he described Turkey as a country "[w]ith Rolls Royce ambitions but Rover resources." Time has proven him right. Back in 2009-10, then Turkey's Prime Minister (now President) Recep Tayyip Erdogan was greeted like a rock star in every Arab capital. He was presumably the darling of the Arab street, including Damascus, Beirut and Egypt -- all of which are today Turkey's regional nemeses. In 2011, an Egyptian columnist wrote a commentary in which he "begged the Turks to lend [them] their prime minister." To which this columnist replied: "By all means. Take him, and you need not return him." Erdogan's "rock star" popularity on the Arab Street was based on a single dimension: his constant Israel-bashing and deep hatred of the Jewish state. "When there are matters of conflict between the Turks and Arabs all those love affairs will disappear," a Lebanese friend said at that time. All the same, Erdogan thought that the rock star treatment would earn him his lifelong dream of reviving the Ottoman Empire with the Sunnis of the former Ottoman lands worshipping a new Turkish caliph. Proof? Turkey was a rising star. In 2008, it had won 151 votes out of 193 members of the United Nations to win easily a coveted non-permanent seat at the UN Security Council [UNSC]. With that seat, Turkey would further reinforce its influence in the region and the world. Erdogan's "rock star" popularity on the Arab Street was based on a single dimension: his constant Israel-bashing and deep hatred of the Jewish state. After Turkey won the Security Council seat, then Foreign Minister (now Deputy Prime Minister) Ali Babacan spoke like a Rolls Royce: "This is the product of our efforts during the last five years. The election is an indication that Turkey's global perception, visibility and influence are on the rise. It shows how positively Turkey is perceived by the international community." Fine. When a country wins a UNSC seat for the first time after 47 years, it is normal that politicians claim credit. But by simple logic, if it had lost the contest in 2008, the defeat should have meant that "Turkey's global perception, visibility and influence were on decline;" how negatively Turkey was being perceived by the international community. Right? Right. Not in the Turkish psyche. On Oct. 16, Turkey once again bid for the same seat it had won six years earlier. A day before the vote, Foreign Minister Mevlut Cavusoglu declared to journalists in New York: "We believe, Allah permitting, that we will get the [positive] result of the work we put in." Allah did not permit. Turkey won merely 60 votes -- compared to 151 in 2008 -- and was defeated by New Zealand and Spain. Does that mean that Turkey is now being negatively perceived by the international community? Or that Turkey's global perception, visibility and influence are on decline? Of course not! Cavusoglu heroically defended the defeat: "There may be those that are disturbed by our principled stance." How lovely! In the Turkish Islamist thinking, the country's election to the UN Security Council is an acknowledgement of Turkey's success story but failure is the work of unprincipled nations who envy Turkey. Enjoy your Rover! It is an open secret in diplomatic circles in Ankara that several Arab and African countries in which Turkey has heavily invested -- both economically and politically -- over the past several years, lobbied against Turkey's UNSC bid. Another group of countries with decent democratic credentials preferred to vote for a country [Spain] with the same democratic credentials, instead of a country known by its alarmingly autocratic resume. Erdogan's Turkey is no longer an attraction for the Muslim Street. Instead, it is, overtly or covertly, on hostile terms with Syria, Egypt, Saudi Arabia, Jordan, the United Arab Emirates and Iran -- all at the same time. 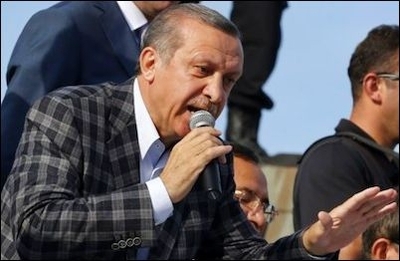 Ironically, after the 2010 Mavi Marmara incident, in which a Turkish flotilla tried to break an Israeli naval blockade aimed at preventing weapons from reaching the Gaza Strip, Erdogan and his then Foreign Minister (now Prime Minister), Ahmet Davutoglu, vowed to "isolate Israel." Instead, it is Turkey that has been badly isolated, with the help of its one-time Arab brothers who had rushed to one city square after another, waving Turkish flags, to attend Erdogan's public rallies in Arab capitals. The U.S. ambassador's wording, "Rolls Royce ambitions," denotes a mental condition that categorically refuses admittance of own fault. In this mind-set, "We are so superb that we cannot be wrong because what we think right is Allah-given." If things go wrong, it must be because of something else. It is often amazing to observe that Erdogan and Davutoglu have every confidence in their foreign policy calculus despite repeated -- and sometimes tragic -- failures. At moments of despair, both men have had the reflex to blame failure on the "wrong world order." It is this childish psychology that, from time to time, when it suits their convenience, prompts them to question the legitimacy of international institutions, including the UN and the UN Security Council. They do not, for instance, question the UN's legitimacy when a resolution denounces Israel. But they question that legitimacy only when it does not fit their agenda. Once, Erdogan said that the permanent UN Security Council members should have Muslim representation. Which country could he have been thinking of? I'll bet he was thinking of the one that he considers the heir to the throne of the Ottoman caliph. For the mess they created in Syria, they have accused the West and NATO. For the failure to move an inch toward European Union membership, they have accused the EU of discriminating against a Muslim country. And most recently, Turkey failed to win the UN Security Council seat because of "those who are disturbed by [Turkey's] principled stance."